Brendan McClorey, Wixom first-year, resides in Wesley Hall and relaxes in his dorm by watching Netflix through his XBox 360 while doing research on his laptop and checking emails on his smart phone. Simultaneously, his roommate watches YouTube videos using his laptop. There isn’t am ethernet cable in sight. McClorey and his roommate, along with every other resident of Wesley, Whitehouse and Mitchell Towers dormitories, are enjoying the new wireless network installed by Albion’s I.T. department over the summer. A means to save money and adapt to an increasingly tech-savvy student body, I.T. insists that the new network is a step forward in every way: speed, reliability, convenience, capacity, mobility and security. According to Scott Stephen, associate vice president for information services and chief information officer, the biggest push for wireless internet came from students bringing more devices to school. Whereas several years ago each student had only a desktop computer requiring a single ethernet port, students are now bringing laptops, smart phones, tablet computers and e-readers. The transition to wireless networking was the result of a convenient combination of timing and demand. According to Beadle, installing wireless access points resulted in a 75 per cent cost reduction. 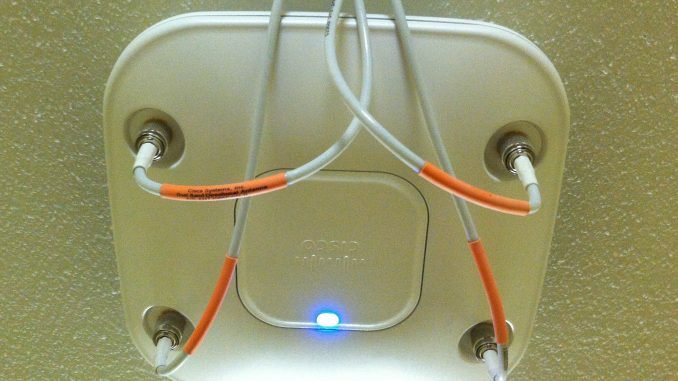 In the days of wired networking, ethernet cable had to be run down every hall and branched into each room. Now, wire need only be run down the halls and installed outside every four rooms are wireless access points, small units on the ceilings that transmit the network signal. According to Beadle, the major advantage of the wireless network for students is that it supports up to five devices per student rather than the old paradigm of “one port per pillow.” Beadle adds that wireless internet is faster and it offers the benefit of mobility, meaning students can pace about their room or mill about campus while maintaining their connection. The location of the access points is another major advantage of a wireless network for a residence hall. Since the access points are outside student rooms in the hallway, I.T. can perform maintenance checks or make adjustments to them with minimal encroachment on student privacy. The major downside to wireless networking is compatibility. Some students are still using older equipment that requires a wired connection. As a result, I.T. has had to reactivate about 10 wired ports across the three buildings, according to Beadle. Challenging misconceptions about wireless internet has been another minor hurdle for I.T. during this transition. Traditionally, wired networks were considered faster, more reliable connections than wireless. According to Stephen, wireless speeds have increased enough that they’re competitive with wired ports. Beadle also insists that the wireless network is just as secure as a wired connection. “We configured the wireless network to follow the same security protocols as the wired network,” Beadle said. Overall, the transition to wireless internet has roused little reaction from students, but Stephan considers this a good thing. “In general, folks don’t say much when things are going well, we take that as a good indication that they’re getting the speed that they want,” Stephen said. “I haven’t had any complaints since the first week,” said Denica Brooks, residence hall director for Whitehouse, Fisk, Ingham, Seaton and Dean. McCloery admits that the network had some issues at the start of the semester, but says he is pleased with the performance since then. According to Stephen, transferring the three halls to wireless is only the first step in a two-step process of creating a completely wireless campus. “Between now and when students come back in 2013, we hope to get the rest of the residences addressed,” Stephen said. In the meantime, Beadle advises students to inform I.T. of any issues they may experience with the internet or any of their devices. That’s great. When I graduated in 1996, the only way to get connected was dial-up modem, and even then, there were limited phone lines available so you often ran into a busy signal! My hat is off to the crew that installed all these units, it must have been quite a job for these people! Everything looks so good and professional. If I could have you pass along my personal gratitude to these hard working people that would be fantastic!